Joseph Young on the drive to the hoop. 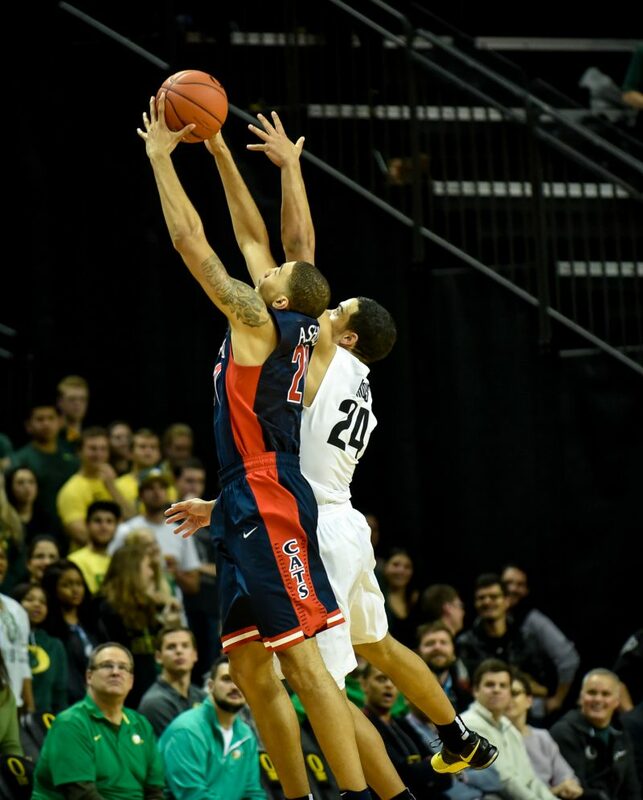 Last night, the Duck men’s basketball team suffered a grueling 80-52 loss to the #5 Arizona Wildcats in the Pac-12 Championship game, giving the Cats their first conference championship since 2002. The Cats have obliterated Oregon in each of their three games this year, winning each by a comfortable margin (80-62 and 90-56 were the regular season scores). The Ducks may not have claimed the Pac-12 title but their ticket to the dance is punched. It would be wise, however, for Coach Altman and his squad to take some crucial lessons from a heart-breaking loss. After all, you learn much more from your losses, than your wins. Here is the main point to take away from this loss: rebounding is essential. This is the most important factor in my mind, especially when there is such a size difference between the two teams. The tallest starter for the Ducks is #1 Jordan Bell, who stands at 6’9. The second tallest starter is Eljin Cook at 6’6. For Arizona, four of their starters are 6’7 or taller (Kaleb Tarczewski, 7’0/Stanley Johnson, 6’7 /Brandon Ashley, 6’9/ and Rondae Hollis-Jefferson, 6’7). Of course, size alone doesn’t necessarily dictate which team wins the battle for the boards. What will kill you is a lack of effort to crash the boards, on both the offensive and defensive side of the ball. 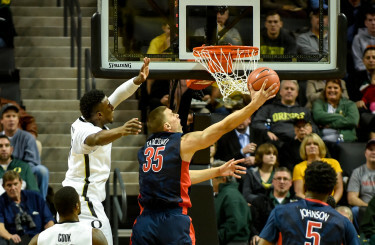 The Ducks managed only 20 rebounds the entire game, only three of which were offensive, while Arizona racked up 37. A scene from the Duck/Wildcat game at Matt Court. To be fair, the rebounding statistic is a bit misleading. The reason is that the Duck offense relies heavily on fast breaks, drives to the basket, and outside shots. In a way, the Ducks’ lack of rebounding can be accredited as more of a symptom of Oregon’s offense. However, the fast break offense will be a big gamble in the NCAA tournament, and will rely more on the streaks of individual players, rather than a team effort. Oregon will need to work on a more slow-paced offense in order to facilitate more offensive production in the paint. The Ducks play Oklahoma State on Friday the 19th in Omaha, Nebraska. The Cowboys have 6 players 6’7 or taller, so the Ducks will have to find a way to win the battle down low.